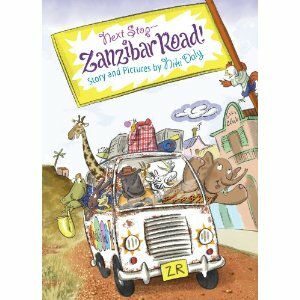 Title: Next Stop Zanzibar Road! In Africa, Mama Jumbo puts on a jazzy dress, struggles to get her hat straight with no mirror, then jumps in Mr. Motiki's taxi to go to the market, where she finds everything she needs and more. as they say in South Africa. Achieving successes like these also often involves cooperation and working together. The story’s light-hearted narrative may seem slight, but it underscores an important fundamental South African concept: Ubuntu, or interconnectedness, which views individuals as only fully realized through their community and its greater good. Finally, the diverse animal characters (some of which are natural enemies, such as Bro Vusi, a lion, that babysits Little Chico, a chicken, while Mama Jumbo goes to market) exemplify the ideal of a multi-ethnic, harmonious community. ”). There also is the clever pun of Mama Jumbo’s address: Number 7-Up (because a sign for the drink hangs above her doorway). The choice of media for the pictures–watercolor, pen, and digital media–has typified several other of Daly’s recent publications, such as The Herd Boy (2012), A Song for Jamela (2009), and Welcome to Zanzibar Road.